What do think of when you hear “buffet”? Probably mediocre food that’s been sitting out for hours, right? 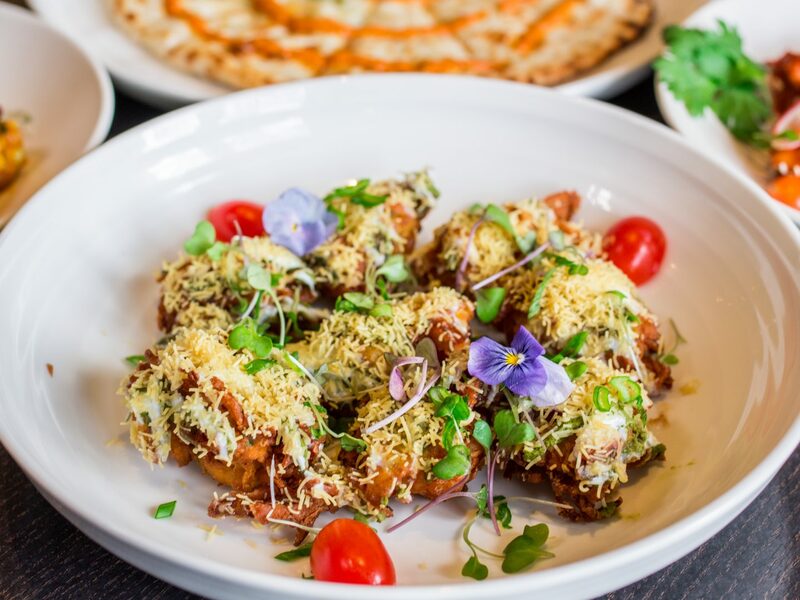 Well, it’s time to completely rethink that word, and there’s no better example of a place flipping that definition on its head than Saffron Indian Bistro. 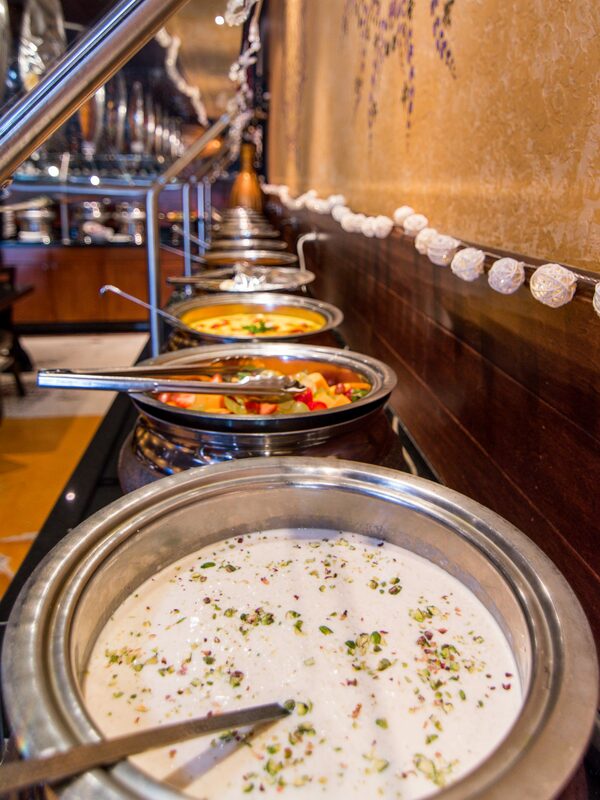 The Indian restaurant located at 1143 San Carlos Avenue in San Carlos, CA not only offers an amazing lunch and dinner buffet, but they also have an out-of-this-world dine-in menu that we’ll explore below. 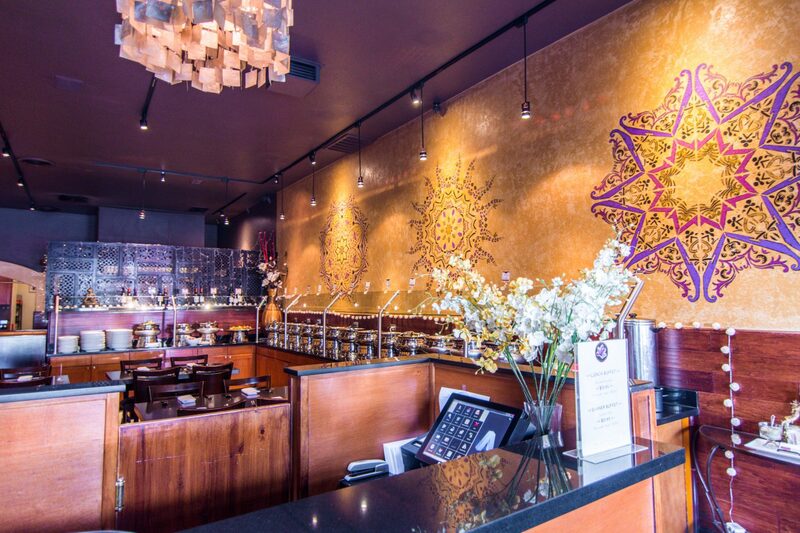 The decor at Saffron Indian Bistro really takes you to another world when you’re inside, and as we walked down the line of pots full of curries, meats, vegetables, fruits, and anything else you can think of, our stomachs started growling non-stop. We were told that many of the same ingredients and dishes you would order off the regular menu are actually available in the buffet pots, which is totally awesome. They’re not skimping on anything, guys. Now let’s check out the dine-in menu! 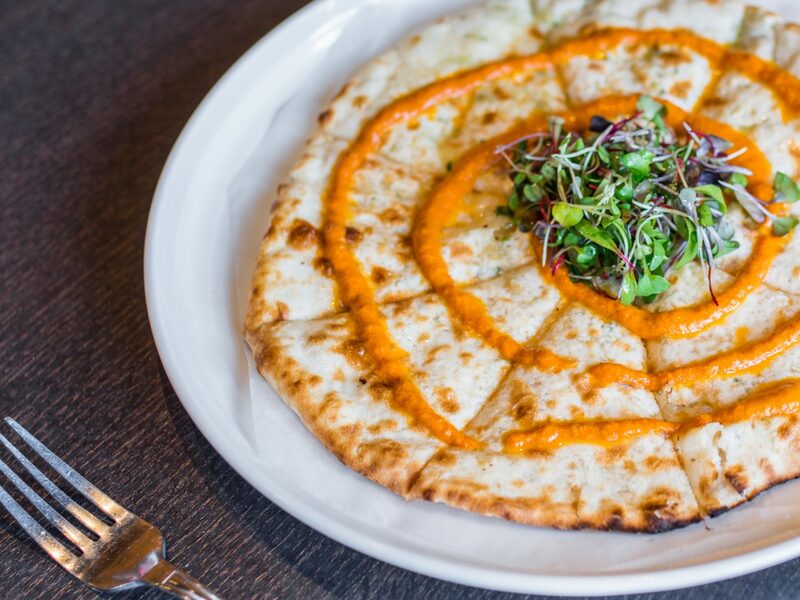 First up was the Cheese Naan with sharp white cheddar cheese, seasoning salts, onion and cilantro topped with market greens. It was doughy, buttery, and flat out incredible by itself, but we also tried mixing it with the Daal Makhani (mentioned later) and it was super bomb – although probably not culturally or traditionally the correct way to eat the dishes. This is a must have and a solid base dish for the rest of your meal. 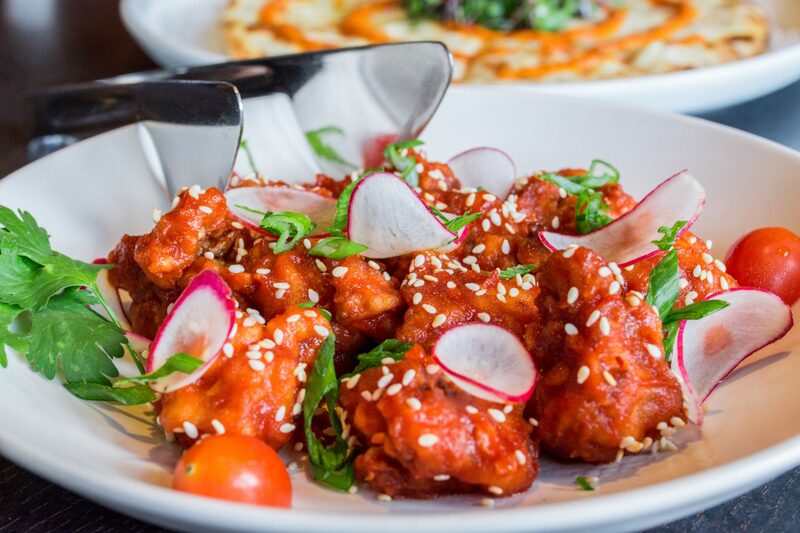 The General Tsao’s Cauliflower, which was Indian Chinese style cauliflower in a tomato chili sauce, chives and sesame seeds, was unexpected given the flavor profile, but turned out to be one of our favorites. It was just spicy enough to get your attention without making you sweat and reach for your glass of water. But the slight sweetness of the chili sauce and the texture of the cauliflower really made this one special. The Spiced Vegetable Cutlet, which consisted of semolina crusted spiced mix vegetables patties served with spicy ketchup, was another on-point dish. We’re just sad it only came with three of them! The consistency reminded us almost of somewhere between mashed potatoes and potato salad (not quite mashed all the way, basically), and when dipped in the sauce and eaten with the diced veggies on top, we couldn’t help but scarf down the whole thing as soon as we tried it. Our next plate was the the Dahi Aloo Poori. This was straight awesome. 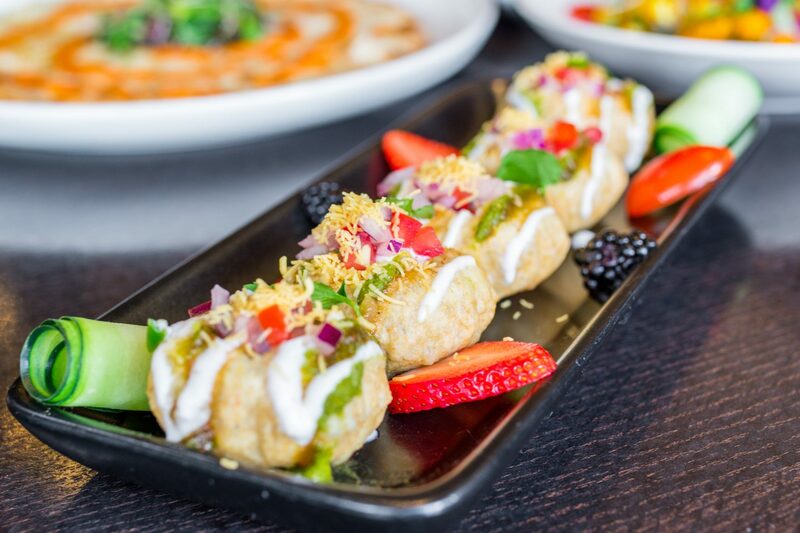 It’s little pooris (semolina puffs) stuffed with potato and chickpeas topped with a selection of chutneys and homemade yogurt. If we had to describe it, we’d say it was like an Indian taco. It had sort of a fresh salsa taste to it with all the ingredients were perfectly distributed among the five bite sized pieces. And when we say “fresh” we really mean it. It was light and refreshing, and grabbing a slice of strawberry or blackberry in between bites was a nice complementary element. 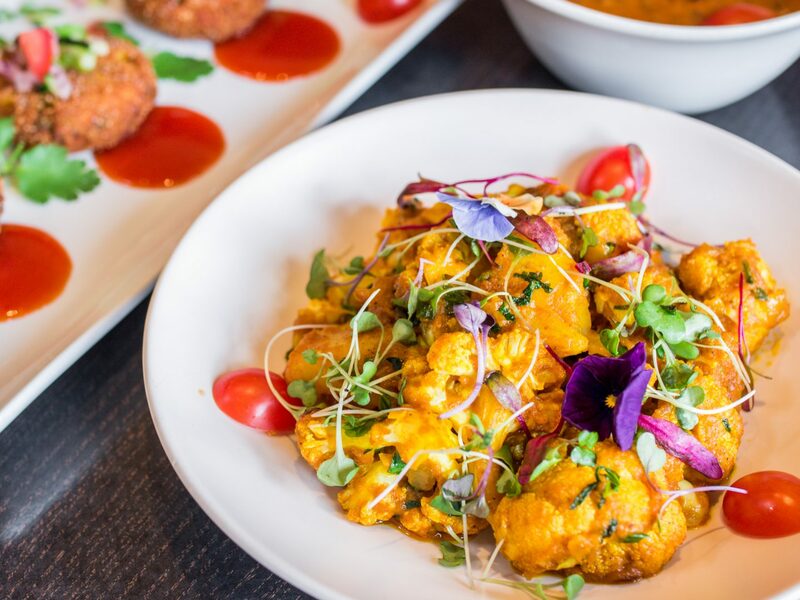 The Adraki Aloo Gobhi was another cauliflower dish made with cauliflower and potatoes tossed in a mild spice blend, cilantro and ginger. This one wasn’t spicy like the other one, but the cauliflower really took on the flavor of the spices used, and made for a really enjoyable experience. This is definitely another must. The Onion Bhaji, consisting of red onion pakoras topped with whipped homemade yogurt and chutneys, was off-the-chain good! The onions were thin and crispy, and again, each piece was crafted with the right amount of each ingredient for the perfect bite. We need more of this in our lives! 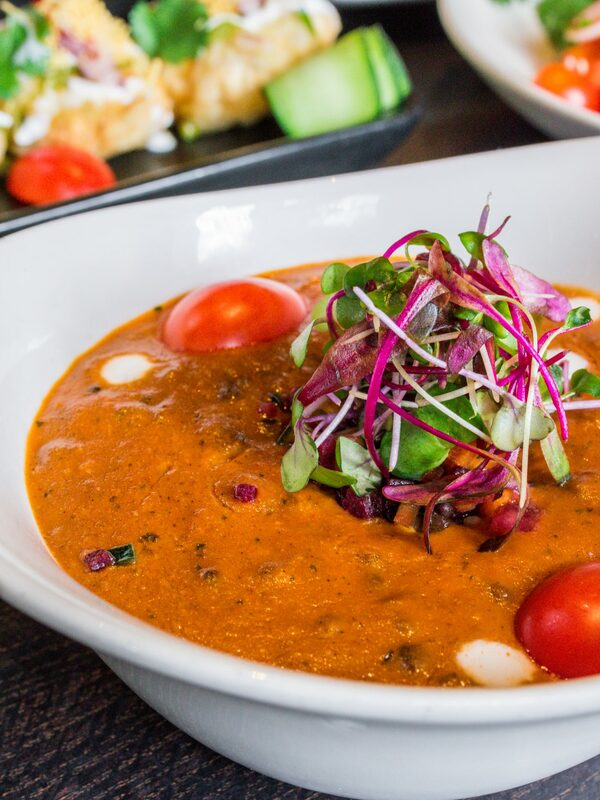 Last up, before we get into the desserts, was Saffron’s Daal Makhani, made of black lentils simmered for over 24 hours with tomatoes and spices and finished with homemade butter. Lentils are just amazing in general and go well with so many dishes, but the way they were integrated into this dish was what really stood out for us. Upon first glance you’d probably think this was just some curry dish, but once you dig down underneath the top layer you find the amazingly cooked lentils mixed in with everything else. 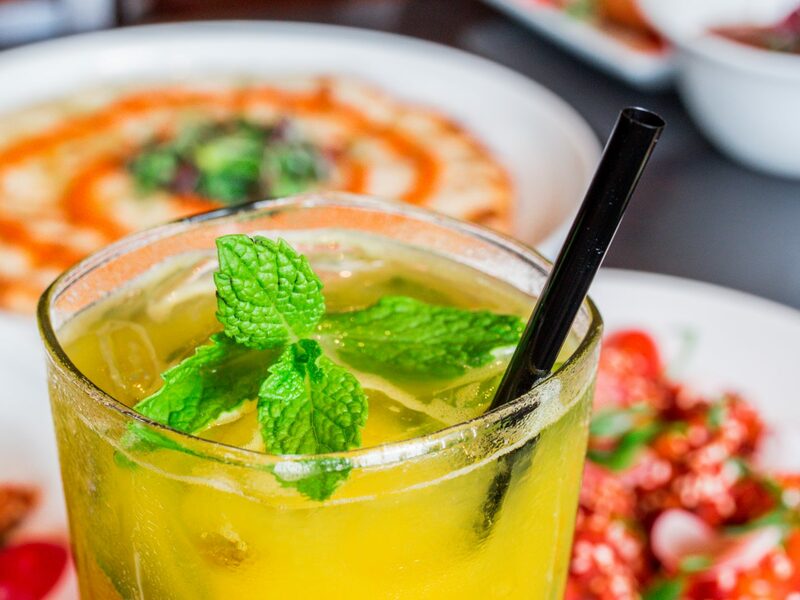 We want to take a quick break from the food to talk about the one drink we got to try – the Mango Ginger-jito. It’s basically what it sounds like – a mojito (minus the alcohol) with some mango added to it. But it was super refreshing and not overly sweet. The sweetness helped to balance out the rest of the spices and flavors from the meal so it was a welcome companion to everything! And, of course, you know we had to get our hands on some desserts! This first one was beautifully plated and tasted as good as it looked. 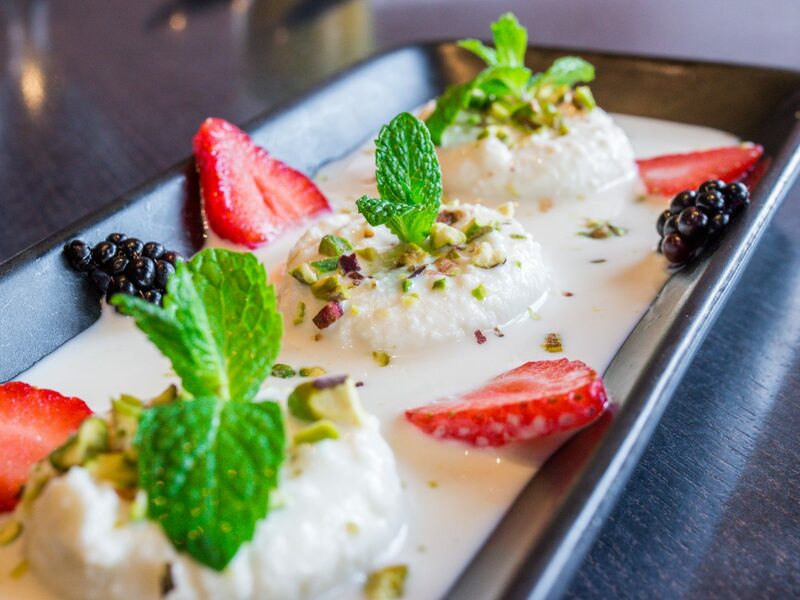 The Rasmalai – homemade cheese dumplings in a sweet milk sauce – was incredible. We’ll admit, we were a little skeptical about cheese in a sweet dessert, but man, were we convinced after taking our first bite. The softness of the cheese combined with the crunchiness of the pistachios and the sweetness of the milk sauce made it almost impossible to stop after we dug in. 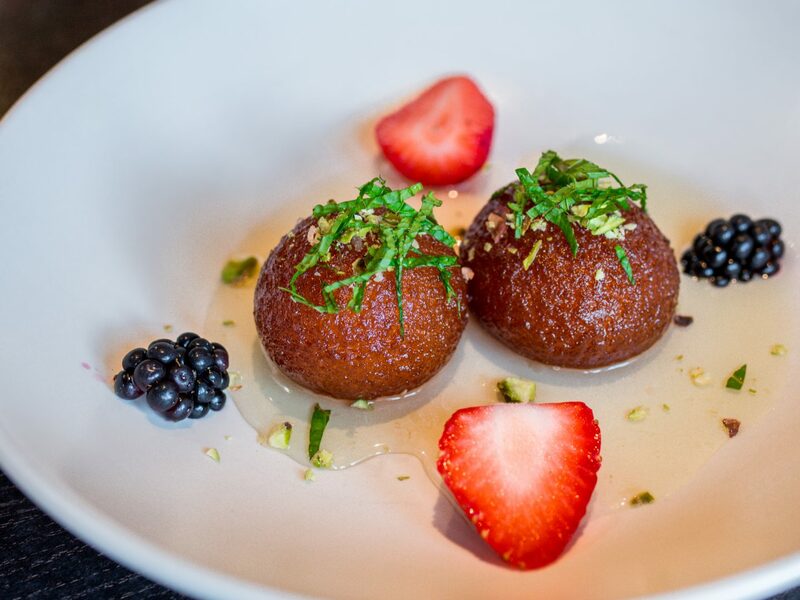 Next was the Gulab Jamun, which was cheese dumplings simmered in sugar syrup sauce and garnished with grated coconuts and pistachios and served hot. The inside was gooey, the outside was a little firmer and had a coating of the sugar syrup. This was probably the sweetest of the desserts, and we’re all for it! If you’re someone with a serious sweet tooth, this is your choice, hands down. So bomb. 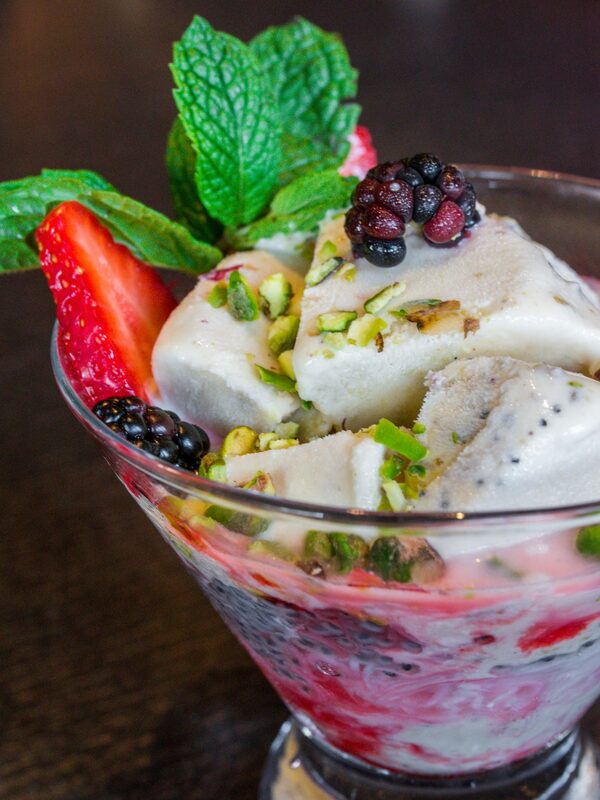 Last, but definitely not least, was the Kulfi Falooda, made of their homemade ice cream, sweet noodles, fruit and pistachios. We’re a big fan of sweet sticky rice in other Asian desserts, and the sweet noodles here reminded us of that flavor so this was an instant hit with us. This was even amazing once it had melted and mixed together a bit more, which is a sign that the ingredients chosen for this dessert truly are complementary in the best way possible. 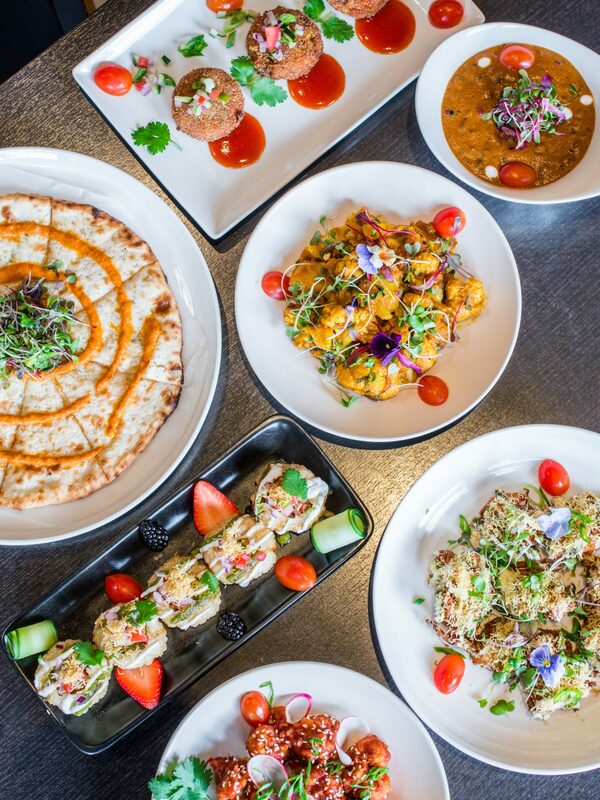 We were beyond impressed by Saffron Indiana Bistro and recommend that everyone within driving distance of San Carlos drop whatever plans you have tonight and head over there for either their AYCE buffet, or their dine-in menu. 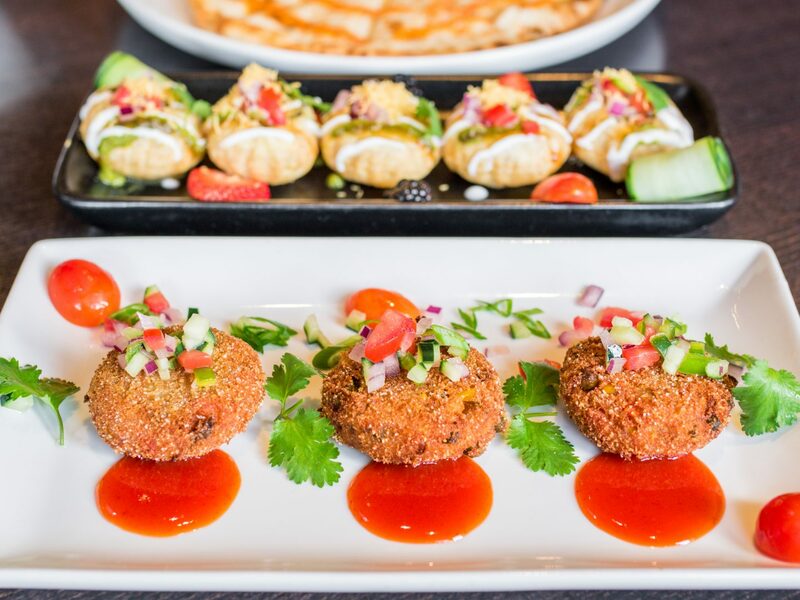 Your bellies and your taste buds will thank you. Till next time, Nomsters!